Facial recognition was also a piece of the camera focused demos. Some of these devices were built directly in to the cabin of cars (pictured to the left). This leads us to one insight we can't possibly ignore – the huge transformation headed for the transportation industry. 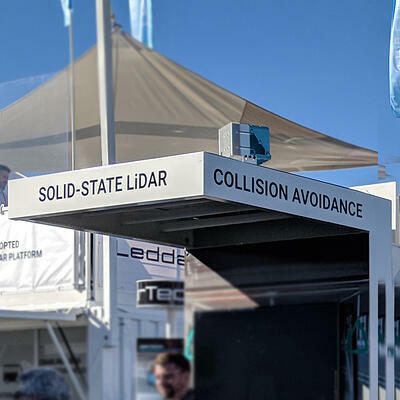 Lasertel's recent work with the leading lidar company, LeddarTech, on long range lidar for vehicles is the simple proof that we are already in the midst of this transformation and the supporting technology is advancing quickly. At Lasertel, we've recently worked through challenges associated with short pulse drivers, high repetition rates and high peak power lasers. [Learn about overcoming some these challenges in our white paper.] These advancements were demonstrated in LeddarTech's reception booth (pictured below). Our laser source was inside a 3D long range lidar system that was placed at the top of the booth (the blue box) and demonstrated live lidar images on a screen inside the booth. Last year, the feasibility of widespread lidar adoption felt like a massive hurdle. 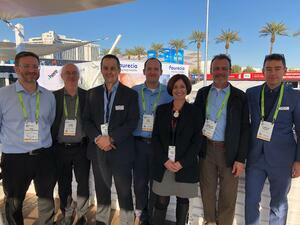 However, the conversations we had and the technology exhibited at CES proves there is no backing down from this becoming a reality. With kickoff initiatives like ride sharing's utilization of self-driving vehicles and eventually fully autonomous vehicles, consumers will be able to try out the technology. Consumers will start to build trust in these technologies which will lead to increased adoption. 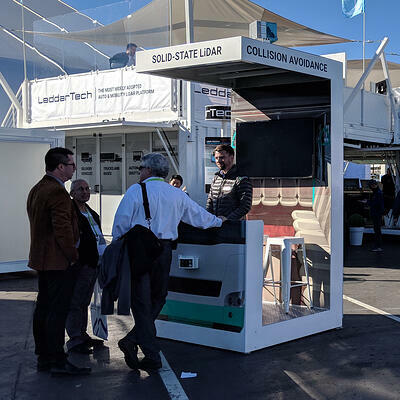 Questions regarding supply chain, such as capacity and cost, to support this were certainly a topic of conversation for those who stopped by Lasertel's booth. The industry is continuing to move toward brand consolidation and partnerships to help support these concerns. Our involvement in the Leddar Ecosystem is a great example of how companies can help support each other in technological advancements in the space. To learn more about partnering with Lasertel on your lidar source project, contact us today! Ready to learn more about automotive lidar advancements? Check out our white paper, Making Waves: Nanosecond Pulsed Drivers for Flash Lidar.